Thank you for your interest in BNI Billings Montana. Every member of BNI Billings acts as a part of the marketing team for the other members of their chapter, with the aim of securing qualified business referrals for each other. Click here to see the most commonly asked questions about BNI membership. How can I get invited as a visitor at a BNI meeting? To ensure you have a productive visit it is best to be an expected guest. This can be done a number of ways. One way is to contact our regional office and have us notify the chapter that you will be visiting. 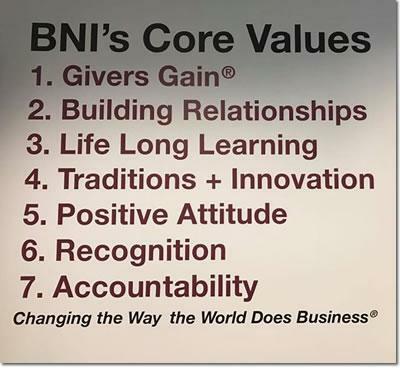 Please contact the BNI Billings office at (406) 690-2175, send email or complete the form on the homepage. You can also be invited by a BNI member or contact a local chapter's president directly. You may also complete the information request form on the homepage of this site. You should note that some professions (particularly financial advisors, P and C Insurance, residential realtors and mortgage brokers) may find it difficult to locate a chapter or forming group with an opening for their business category. To find out how we can assist you to start your own chapter, contact the BNI Billings office at (406) 690-2175 or send email. We will be delighted to speak with you about the development of a new chapter.